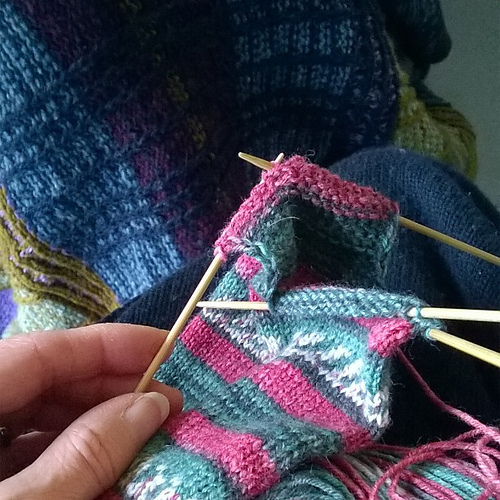 Today I dedicated my knitting effort to the second sock of my Christmas Day cast on pair. FL had a night of sickness and diarrhea and was just emerging from a clean-up operation when I arrived at the hospice this morning. He was soon fast asleep and did not stir when his lunch was brought. I took a break from my watch over him to get myself a coffee and while I was gone, he had to call for assistance to get to the toilet again. Oh dear! A little later, a physiotherapist came to see him and gave him a lesson in zimmer frame management. He was surprisingly compliant, probably because he was too tired to argue. Shortly after that he was plumbed in to a saline drip, to try to get him rehydrated. At 2.30pm he woke and was clearly in some pain. I called the nurse, who said that he had not had any painkillers at all that day: they are trying to clear his system of morphine as they believe it is responsible for his kidney failure. She consulted the doctor and it was agreed to give him a Hydromorphone “breakthrough” pill. At 3.30pm I decided to head home to avoid the rush hour and see to the dog before it got dark. I woke him to say goodbye and he told me he had a new pain, somewhere below his left ribs. I decided to tell the doctor before I left, and she came straightaway. It was hard to know where he was pointing, as he was slumped in his chair, and the doctor decided the best idea would be to get him into bed, in case it was simply a case of cramp, caused by sleeping in an awkward position She was awfully kind, and said she was looking forward to talking to him about his book when he was feeling a bit better. Her main advice was to ensure he has a quiet weekend, to allow him to recover from the effects of the morphine which she thinks had built up to a toxic level. His kidneys had not been able to cope and everything had started to go wrong as a result. And I don’t know whether that means there might be hope of recovery from this. I don’t think that kidney damage is reversible…? It is so difficult not to grasp at straws, to think that this is all just a temporary downturn and that he will soon be back to his old self. I suppose nobody knows for sure, not even the doctors.